So far in this series I've covered the gear and the general flow of a competition. In this installment I'll give you my tips for a successful competition. These are the fundamentals that I've learned along the way. For the past few weeks I've been mentoring a buddy of mine who will be competing for the first time next weekend. My advising him has renewed these basics in my mind, so I thought I'd capture them and pass them along. There is so much to learn that your first competition can be overwhelming. Research and "BBQ recon" will dramatically help flatten the learning curve. I highly recommend reading everything you can get your hands on. Know the rules backward and forward, and religiously abide by them. Read a couple good books like Paul Kirk's Championship Barbecue and Dr. BBQ's Big-Time Barbecue Cookbook. Join your local or regional barbecue association and participate in the forum discussions. Read and participate in the national internet forums such as The BBQ Brethren, The Smoke Ring and BBQ Central. Use Google and YouTube to find articles, pictures and videos. Here is an example of what can be found. Monitor BBQ blogs via RSS or through an aggregator like Alltop. Of course, you will find that there is a lot of noise mixed in with the good information on the internet. That's why it's important to get your information from a variety of sources. You will quickly notice solid trends and those are the gold nuggets. As I wrote in the previous post in this series, I cannot overemphasize the importance of practice. Practice cooking one category at a time in mock competition. Do everything exactly like you plan to do it at a contest, including building practice turn-in boxes. Once you are satisfied with each category, cook all four categories and invite some friends over to act as judges. There are already enough variables in competition cooking. Don't complicate things by trying to do things differently for each category. If you're like I was early on, you'll try to find a different rub, sauce and wood combination for each meat. Don't. Find one good flavor profile that works for all of the meats. There will be plenty of time for experimentation as you gain experience and confidence. All the practice in the world won't help if you can't remember what you did from one cook to the next. A good set of notes and a cook log will help you find opportunities to improve. It's also important to take pictures. You know how many words a picture is worth. I touched on this in the post about the gear. Develop an equipment checklist (here's mine) and take only what you need. Of course, weather plays a huge role in that, so also plan for what you might need in a worst case scenario. Bottom line: don't take everything but the kitchen sink. In the last post I also mentioned the importance of developing your own cooking timeline for each category. Start at the turn-in time and work backward in 15-30 minute intervals. This will really help minimize the "What should I be doing now?" chaos. The plan will boost your confidence because you'll know what to do when. If you've kept things simple and have practiced, you will be well on your way to a repeatable process. I wish I had done this early on. The old "The only dumb question is the one that you don't ask" adage is infinitely applicable here. Find credible and experienced sources of information and ask a lot of questions. I think you will find that most cooks are more than willing to help, but they can't help if they don't know what help you need. When you get to your first competition introduce yourself to other nearby competitors and flat out ask if they are willing to help with questions. Just be honest and I think you'll be surprised at the openness of many cooks. You may be an outstanding backyard barbeque cook and your friends, family and neighbors may rave about your food, but that is a far cry from competition cooking. Keep in mind that those close to you are not usually brutally honest about your food. They will usually be nice because they have good social graces. Judges, however, don't know which turn-in belongs to whom because the system is designed that way. Judges are also very clinical in their evaluation, which is as it should be. You will find very quickly that judges are indeed brutally honest. Given all this, check your ego in the parking lot and do your best. I think you'll find that the system works fairly well, but it is also very efficient at dispensing humility. Competitions are fun. That's a large part of the allure of competition cooking. I encourage you to invite your family and a few friends and have a good time. At the same time, I also discourage you from partaking of too many adult beverages and taking your eye off the ball. It's not a family reunion, it's a competition with money on the line. You've (hopefully) worked too hard and invested too much time and money to let this turn into a bad episode of MTV's Spring Break Marathon. This goes hand-in-hand with doing your homework and checking your ego. If you do diligent research you will quickly note some distinctive trends in flavors and processes. Don't try to swim upstream. Keep in mind that much of what you will read are lessons learned as the result of the trial and error of others. You will also notice that the cream of the competitive crop are very consistent. They find something that works and they continually polish it. I am not at all discouraging experimentation and creativity. I'm simply saying that bucking major trends is not generally advisable. Much like any other avocation, if you stop having fun, it's time to look for another way to spend your time. 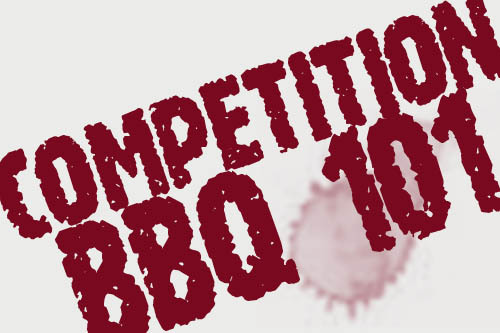 Competition barbecue is hard work, but it's also a lot of fun (or should be). I am thinking about competing in my first competitive BBQ competition in the near future and this post was the best resource I could find. Thank you a ton for this and I will be keep you updated on how I do! Thanks, Bob. Go get 'em! Doing my first comp in 2 months. That was great advise, thanks. Bruce - Thanks for your kind words.